As soon as Lisa started talking I knew that I was in the right place at the right time. She is the perfect combination of high intellect and high vibrational energy. Being in her presence made me instantly feel I wanted to be under her guidance and learn more about her gifts and connection to Spirit. Without a bit of hesitation I signed up for her Level One two day workshop to deepen my intuitive skills. In short it was beyond my expectations being beautifully organized, educational and expertly led to immediately start some hands on practice. The two days flew by and I am looking forward to Level Two! 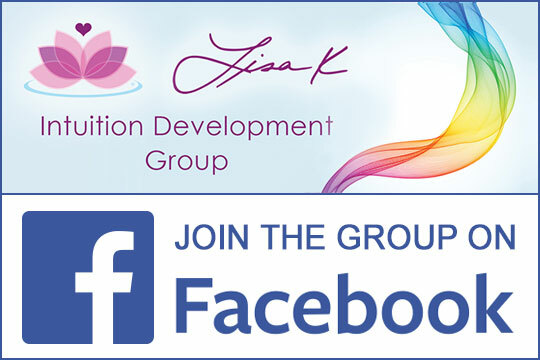 I would recommend both Lisa K is a gift to all who are blessed to come in contact with her! – Iris M.
I knew when my cousin passed. I also had a friend pass last week. I “knew” that he passed when I received the call. It was presented to me as a physical edginess that when I identified it as my friend it passed. Then Friday night, I had the sense of a freezing pipe, I then checked on the boiler, to find it stopped working! The fuel line was frozen! If I had not checked… Would have gone to bed…Lots of frozen pipes would have been the outcome! Called for service, had the house only get to 40 degrees! You and your teachings have been a gift! I wanted to tell you about how my intuition has grown from taking your classes. Friday, I was leaving work happy that I completed my hours without needing to make up any extra hours and as I was happily walking to my car not even thinking about it, my intuition told me,”You forgot your Debit card.” Usually this happens by just remembering but like I said the thought was random it completely was not on my mind. it was like an interruption and came out of no where before I got to my car. When I got back to my office there it was in my desk! I love your stuff! Ever since I saw you teaching about intuition on YouTube…you got me hooked by how you made using intuition look so simple. I have heard people teach about intuition but many times it always went over my head until I heard you….you broke it down just the way I like it. You are a great teacher. It’s a gift. – Caroline J.
Lisa makes a great first impression and inspires confidence when you first meet her. For that reason, I was glad to sign up for her class. The class exceeded even my high expectations because Lisa distills complex information and presents it in a clear, concise and fun manner. She is a very thoughtful teacher and seems to think of everything to make her students comfortable. The class was very crucial for me to understand energy healing in a new and exciting way which will definitely enhance my life. Lisa’s helpful, positive, and smart teaching make it a pleasure to learn from her! V.S. Dear Lisa, I want to thank you so much for the wonderful class!!! It was just what I was looking for!! You are an amazing, gifted woman and I think your high vibration and intention, made it easier for us to connect with the angels. I really enjoyed every minute! I am so happy I got to meet you and benefit from your teaching. My life has been greatly enriched. With radiant love and light, – Stacey L.
Just finished a two-day Level 1 certification class with Lisa K on Developing Your Intuition. Fantastic! – D.G. We have a awesome teacher:) – S.D. Just finished 2 day ‘Developing your Intuition’ Certification Class with Lisa K. Loved every minute and it flew by… S.M. Being a realist and skeptic left me somewhat deficient in experiencing the solace that one gains from traditional religion, faith or loving kindness in most forms. During a period of chaos and life transition, I was introduced to angel readings with Lisa K. I have found the readings to be a consistent source of guidance, provoking in me a sense of well-being which I have come to treasure. Lisa K has a gift which she shares with the recipients of her readings as a true conduit to the angelic spirits and their messages. As a result of these sessions and insights received, I have pursued a study in this area and gained direction, clarity and a spiritual peace I consider a blessing. I thank Lisa for sharing her gift and would encourage other “seekers” to avail themselves of this truly remarkable experience. – K.P. WOW…What a spot on reading. So much of this rang true. … Gosh there’s so much more, but like I said, this reading was really spot on! Thanks so much. I’ll be printing it out and keeping it beside me to refer to. Love ya Lisa! You’re a true angel. – D.D. Thank-you so much for the wonderful reading you gave me yesterday , you truly have a gift! – J. H.
Thank you again! You and the angels are like therapy to me! Thank God for all of you!! – C.R. Hi Lisa, I wanted to reach out and thank you for your guidance yesterday. It was extremely helpful and gave me a lot of clarity. – T.D. I wanted to thank you for the wonderful insightful reading you gave me yesterday at the Awakenings Fair. I found that a 15 minute reading was perfect for what I needed. – D.S. Hi Lisa! – Thank you again! I had a great experience! I feel like my mind can finally rest about the direction I need to go in 🙂 Your work and abilities are very special! L.J. Hi Lisa, I must say that what you were picking up is exactly how I am feeling. It is just amazing how you can sense all that, you are truly gifted and I am very luck to have found you, your show and your co-host to help me with furthering my connections with my Angels and helping to assist me with my life issues. Thank you and I hope that your day is filled with much light and love, P.A. I had a reading with Lisa a little over a year ago, and everything she told me would happen came true! – J.D. Your reading was so amazing that I wanted to share with you some of the other validations…. As you can see, you gave me one heck of a reading! Thank you sooo much once again, you blew me away with your accuracy and gift. Thank you for helping me so very very much. I love you sooo much!!! K.S. Hi Lisa, I enjoyed meeting with you as well! You emit a very calming energy! I am working on crossing over the ghost that has been with me for so many years, “Tom.” I have come to a point now that I do not want him around anymore! I thank you for that! I don’t believe that I would have completely felt ready to put him to rest if I had not met with you! You confirmed that he is manipulating me in believing that his presence is positive when it is not! Thank you so much for the time that you spent with me. I will definitely connect with you again in the near future! Many Blessings, ~A.B. Thank you so much Lisa! I love how you approach things and how you do readings. You are very good at it too! But most of all, I like that you are very approachable and I feel like I could connect with you on many levels (which is something that hasn’t happened with other readers). You have good energy I can tell (I hope that doesn’t sound weird). So keep up the good work! I am sure that you will be a great success (as if you aren’t already)! – L. D.
Dear Lisa, Yes! I did receive your reading and loved it. It was very comforting to me. You are gifted and you have a pure heart. Thank you very much for your wonderful reading. Most of the issues you brought up I recognized immediately. I was very happy to receive confirmation of something I’ve long believed and trusted in…Everything else that you said in response to my questions ring true. You have helped me a great deal. Bless you for your service and your pure heart. – T.B. Dear Lisa, Thanks so much for a powerful reading. Regarding me and my issues … you were right on point. You’ve given me a lot to think about. – M.L. Dear Lisa! WOW, you were spot on everything! Thank you so much! You did really really well! – G.P. Hi Lisa, It was great to talk to you this morning. I feel so much lighter and more self assured. Thank you! – M.G. Hi Lisa, Thanks so much for the reading and chatting with you the other day, It was great! M.C. Dear Lisa, I found your reading at the yahoo site and thank you so much. I really appreciate it alot. It did ring true. You are truely an AWESOME ANGEL THERAPIST AND LIGHTWORKER! And you are so profoundly clairvoyant!!! – R.R. Dear Lisa, Thank you for such an uplifting experience. The vibes coming out of your room are soothing and help making a session with you extremely relaxing. The messages are clear and make perfect sense. You are indeed a gifted emissary. A feeling of deep calm and trust stayed with me all through the day. I will be back for more!! – M.C. Hi Lisa, Thank you for the reading. It really was very accurate. N’s reading was really right on for him and where he is in his life now, thank you for sending his. – P.M. The reading was fantastic! I’ll be back, I have more questions – H.T. I highly recommend it (Lisa’s angel reading) to anyone. I want to do it again. – J.C. Thank you also for my reading. I am so positive that was Blessed Mother who appeared at my right side and I am SO grateful to hear it validated for me by someone else !I absolutely adore her energy and working with her. Thank you again for the enlightening reading . – D.
Lisa…what can I say other than a BIG THANK YOU !! You are truly blessed and because of that I feel equally blessed in having had this reading from you. You’re absolutely right, I do need to hear that my angels are with me…..nice to see that I have 3 with me. You don’t know how good this makes me feel that they do hear my prayers and are there for me & caring for me. I also needed that reminder that those that I share of love for are bound to me by our hearts, whether we are near or far. Thank you again for this, it truly means so much and has soothed my soul today : ) – M.A. I think you are an exceptional person, who places herself within the humble confines of humanity. There are many masters, teachers and philosophers that the world knows, but one can be this to those in close proximity, like knowing you through B’net. I find you to be such a heart felt, honest person, who leads her life by the heart and soul inner wisdom that this gives you. – B.
Dear Lisa, Thank you for your beautiful message from the Angels. Your messages/theirs seem to find me at the perfect moment, telling me what I am most in need of hearing. Thank you. love & light, G.
Wow, Lisa, I felt that the angels were speaking directly to me. … By the way, I just joined this group. I felt I had to do it after reading the angel messages, such hope and honesty in them. I also sense that you are truly an enlightened being. Thank you for sharing these messages with us. love and blessings to all, L.
Wow! Lisa, I am crying right now because I read the message for the day and I can’t help but feel like they are speaking directly to me. It’s strange. I wish that I could hug them. Thank you so much for your prayers. It means the world to me. It makes me feel that I am not alone. Love, M.
Lisa, These messages are so beautiful and ring so true. Thank you so much for being such a beautiful instrument of peace. Thank you angels xoxo Love, J. Thank you Lisa, your angels are right on target….this is what I needed to hear today…C. Hello Lisa, what a beautiful inspiration you are to this site. Once more I thank you for sharing what you know, and all the work you do. You have such knowledgable eyes that say to me… I am an old soul, and I am here to spread togetherness, love and peace. I am here to teach, to learn to guide. I am not above you, I am with you. I am in the presence of Angels and that presence, I give to you. I truly believe your journey is to walk with the Angels, just by what you give to others. It is with such Grace that I have met you, with such love that bonds me to this site of Angels. Blessings, Irish. Lisa, I just wanted to say thanks again for that reading, it was amazing and so right on !! I am trying each day to talk and connect with my angels more and more and last week I had the most amazing feeling of love surrounding me. Too hard to put into words, but I truly felt the love God and the angels have for us. I was sitting at work when this happened and let me tell you, the rest of my day went so well !! M.C. I really appreciate your help. Thank you for this wonderful reading. Many blessings, I.N. Hello Lisa, Thank you very much for a wonderful, uplifting and inspiring reading. I am so happy with it. You are truly gifted and blessed. Sincerely, C.L. Thank you, this was amazing! H.R. Hi Lisa, Thanks so much for this reading. It’s so on target. This has been so very helpful, and I really, really appreciate it! M.L.